Ed. Note- Continue below for even more photos for the Chieftains and Rams. Note that you can click any image to enlarge and launch a slideshow. Bolton, Mass. 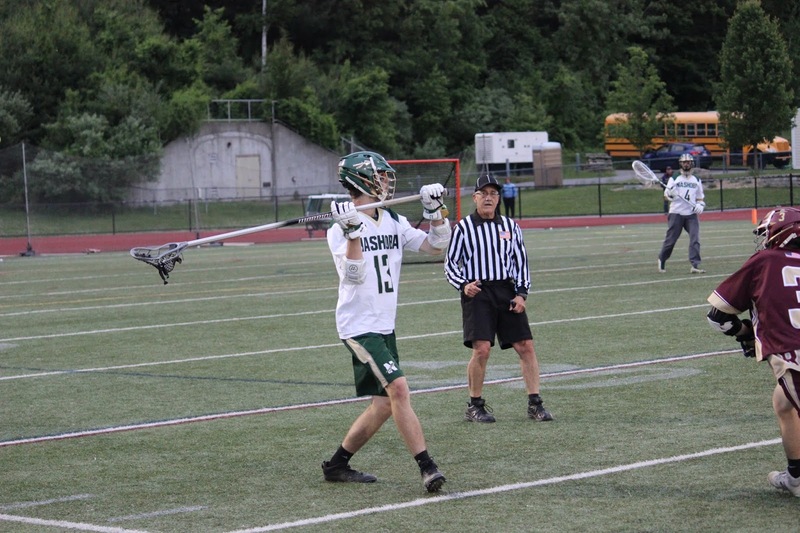 - The host Nashoba Chieftains started their 2018 playoffs with a bang Tuesday night, defeating the Shepherd Hill Rams 13-7 for the program’s first tournament win since 2011. In the first quarter, it took senior stand-out Bryce Chaput, who had 63 goals in the regular season, only 26 seconds to score the opening goal for the Chieftains. His goal was countered, however, by goals from Shepherd Hill’s Anthony Detarando and Tristan Pietz. It was all Nashoba after that, as sophomore middie Sam Vanasse scored to tie the game, and then junior attackman Rory Boots nipped the top corner as the clock expired. After a quarter, the Chieftains led 3-2. In the second, Chaput added another goal to his tally to put Nashoba up two. His classmate Graham Chapman scored his first of the game, which was countered by a goal from Rams sophomore Evan Fasolo. Nashoba’s Aidan Lee scored the final goal of the half, and at the break the Chieftains led 6-3. Shepherd Hill goalie Anthony List kept the Rams in the game, making four of his seven total saves in the second quarter. In the second half, the Chieftains lit up the Shepherd Hill net. Chaput scored his third of the game, and then Boots added his second. After a momentum-breaking goal by Sean Tully for the Rams, Nashoba still had a 8-4 lead going into the final quarter. The next five goals were scored by Nashoba. In the first two minutes, goals by Luke McConnell and Michael Henderson gave the Chieftains a six-goal cushion. Then Graham Chapman scored his second of the game, which was followed by a fourth from Chaput. The Rams would not go down without a fight, though. After a Chieftain goal by Bennett MacGregor, Shepherd Hill scored the final three of the game, with goals from Tristan Pietz, Nolan Burke, and Seamus O'Brien. Led by 4 fourth quarter saves by Nashoba goalie Kameron Gilchrest, the Chieftain defense was too much for the visiting Rams. The junior goalie finished with ten saves between the pipes. Shepherd Hill finishes its season at 9-10, and Pietz graduates as the program's all-time leading scorer with 320 points (146G, 174A). Nashoba has a tall task ahead of it in the second round of the D2 Central/West Playoffs, as the Chieftains now travel to face top-seeded Western Mass powerhouse Longmeadow this Friday at 5 pm.